The most important concept I have learnt in life, and have always believed in, is to be forewarned is to be forearmed. As a student of the art who believes astrology can predict the future, some may see me as pessimistic, in anticipating the possibilities of what might come into fruition. Maybe that is the reason why I have come to behave in the manner that one should always be prepare for whatever situation one encounters. “Be prepared” was my key word I learnt in the cub scouts. My birth chart disposes me to see the optimistic side, to a point of being unrealistic, this aspect in my personality caused me to be concern when a fellow worker expressed his apprehensions for the financial situation in the coming year. 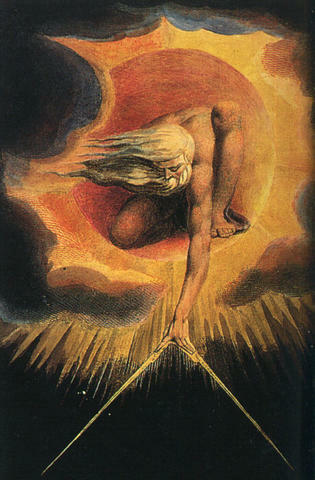 Normally I would not give this a second thought because of the times we are going through, but having studied his natal chart with Jupiter and Venus on the angle of the first house which gives him the ability to see through the darkness to the light of any situation, I began to wonder what in his solar return in the coming year would indicate his concern. His solar return chart for the New Year shows an empty second house, which immediately instilled in me a sense of caution, telling me to look before I leap to any conclusions. Before studying Morin, I might assume that the finances would not have been a major issue to be considered in the pursuing period. Following Morin’s steps in delineating the solar return, it becomes obvious that the matter is nagging on him, but differently then what appears to be the reason. The chart has almost returned back to the original position it was in, in the natal. Venus and Jupiter have returned to the same angle, with Saturn in Libra also conjunct an angle. The ruler of the second finance house is Venus, in a sign it is happy in. 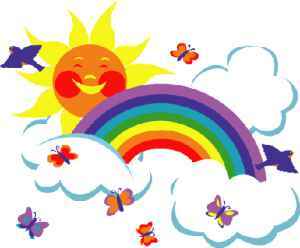 The Sun has returned to the eleventh house of wishes, goals and friends who help him in accomplishing his goals. All these factors points to a very important year, where things can be accomplished as the assets, the talents, the promises and the gifts given at birth will be at his finger tips, during the coming year. Generally a good period for everything involving profession, occupation, reputation, fortune, finances, and investing. With the natal second on the solar return ascendant, it shows concern in the area of his finances, in his possessions, in relationship to his feelings, in his abilities to nurture, in his willingness to protect and in what he considers to be within his domain and interest. Care, caution and consideration are a necessity when he gets involved in the sharing of ideas, in working with contracts and in the signing of legal documents. During this time the thoughts floating through the individual’s insight may appear far fetched and even quite abstract even to himself, but he needs to trust his instinct and follow his feelings, as success will be in reach, even though it doesn’t seem apparent. New interests, unexpected directions and projects will force the individual out of his familiarity and comfort zone, leading him into new vistas, testing his confidence and intuition. This experience will be giving him new areas in which to explore and surmount any situation in the way he does best. The time is now for personal reassessment of the rules he judges himself by and the clarification and revision of his objectives and vision in which to integrate his rational thinking with his emotional feelings. In this way he will be able to turn his concepts and thoughts into the reality he understands and can appreciate and work with. With any delineation of any chart, the stars indicate the directions and energies; the individual has the freedom of choice to decide to fulfill the promise or allow the cause and the effect to make their own choices. Whether the future indicates benefic or malefic outcomes, how we choose to live will determine the degree it will accomplish in its end results. As the gifts and the blessings may be indicated, the final outcomes depend on the actions of the individual involved. Even with the stars working with the individual, the person in question needs to take control of his life and to be consciously alert and to be articulate in his thoughts and action. As with the astrologer in delineating the chart, the consultant in carrying out and fulfilling the promise of the chart, needs to look before he or she leaps into action, if success is to be achieve. 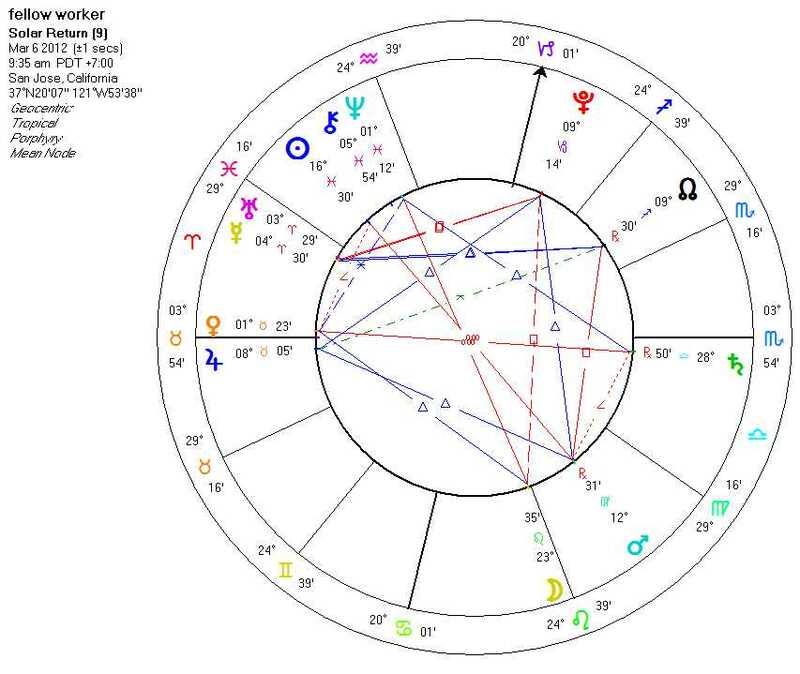 As an astrologer who is interested in restoring our art to the general public as a respected field of study with a proven method for accuracy, I was pleased to rediscover Morin’s method of a quick assessment of a natal chart with an accuracy that would delight any student or professional of the subject matter. It has been my experience that any friend who is halfway interested in astrology that finds out that you have been studying astrology for awhile, will always want you to give them a quick synopsis of the condition one thinks their natal chart is in, in achieving their hearts desire. This is a great way to advance astrology in the minds of the public that the practice is more then superstition and a parlor game and entertainment to whittle the time away. But I must emphasized that I whole heartily agree with Morin, the chart only indicates and implies, and that the individual has the freedom of choice to decide on what direction, his or her life is to take. The Universe may indicate the path, but each individual has the freedom of choice between the selections that are laid out in front of them, whether to take the journey or to forego it. The following is taken from “The Planetary Powers – The Morin Method” by Patti Tobin Brittain, which can be found on page ninety four, number seven. “7.) One can usually judge from the beginning if the horoscope is fortunate or unfortunate by properly evaluating the planets in houses one and ten. Also look at the lights. [Sun and the Moon to determine if one or the other is afflicted].” This makes so much sense as the first house represents who we are physically and mentally. It describes who we are, the way we are, the secrets, the fears, and the complexities of our personality that lie open and hidden, from those who surround us and care. The planets in the house color the ascendant and with the ruler of the sign on the first to bring a rainbow of traits for us to work with and to blend into the personality we allow others to see. The tenth house shows our status among our peers and how we appear to others and what others think of us and our status. This house indicates the achievements we feel we encompass and may achieve in this lifetime. The planets in the house and the ruler describe how and the way we may accomplish what we desire. The sun is our essence and our being, and the moon is our abilities, assets, liabilities and emotions that nourish the ideas into reality. Working with these concepts, we must not forget the essential dignities, the aspects, the signs and the houses themselves. Are the signs and planets conducive to the house one and ten, and in which way does the sign contribute to the house in question? Is the planet happy in the sign and the degree it is in, and how does it aspect the ruler of the sign? Are there any benefic or malefic planets in the houses in question, if so; in what condition are they in? In considering benefic or malefic planets, one must realize, there is no black and white conclusion one can come to. With the blessings of Jupiter giving us everything we need, we need to consider when this giving becomes a destructive behavior allowing us not to develop our ability to create something by ourselves? The same is true with the restrictive Saturn forcing us to use the talents we have come into this world with and the talents we have developed, to create the vision we desire. When is a good thing too much and when does some destructive force, become a beginning to something that will benefit us in the long run? Taking all these concepts and blending them into a whole, one comes up with the conclusion of what are the assets and liabilities needed, to accomplish the task in front of us. The important final result is not whether the natal is favorable or not, but have we discovered the assets and liabilities that may be the turning point for the individual to get closer to his or her dreams and fulfill the promise of the chart. I have seen charts that have everything apparently going for it, and the chart did not meet up with expectations, and why is this? 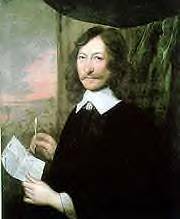 I suspect as modern astrologers we have forgotten to apply the essential dignities of the planet in question, and did not see the weakness that was inherent in the individual, in order to advise the person to be watchful and to advise how to work with the limitation to their advantage. I found this true with a malefic planet in a chart indicating great difficulties, but because of the condition of its dignity and aspect was able to surmount the situation and work with it to achieve his goals. It is important to look at the assets and liabilities of the planets, signs and houses, before coming to a conclusion, as one little unimportant point may be the key and turning point to failure or success. As Morin emphasized and stressed, that we as individuals have the free will to choose and decide our outcomes. After you follow and practice Morin’s method on a quick assessment of a natal chart, you too, will shout fantastic or better still, as chartastic! 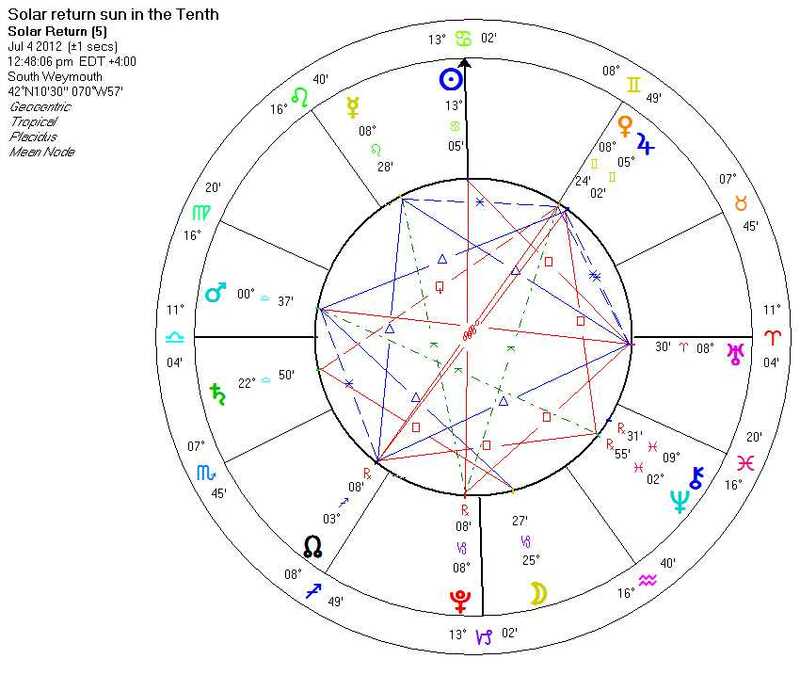 I have been studying the art of horary for a while, but have always felt inadequate in the delineation or explanation of the chart in question. I noticed that I would possibly come up with the right conclusion, but the steps I took to come to the final answer were vague and unprofessional in my opinion, which depended more on my intuition then facts. This has made me hesitant in commenting to my egroups on any horary query in discussion, but as I continued my studies on traditional astrology, John Frawley and Morin, I realized by not having the basic aphorisms and dignities committed to memory, where the information can be readily brought to consciousness when needed, was my big mistake which gave me my insecurities. The history of astrology has implied that astrologers first practiced the art of horary before the art of natal delineation, as it was difficult to determine the correct birth time of most common folks of the period. In Horary a question is asked of the astrologer, and the birth time of the question gives birth to the answer. The astrological time is determined when the astrologer understands the question given to him. Today the answers appear to be more black and white, as in a yes or no, or to the location of a lost item, or which team is going to win? 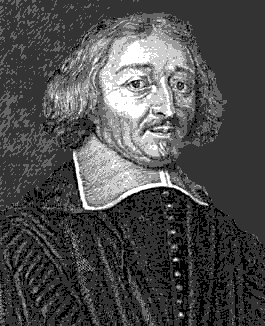 In the time of William Lilly and Morin, the astrologers gave a more detail account of the situations and circumstances of the question at hand. In our complex world today I can understand why we want to go directly to the chase and outcome, rather then why the situation came up in the first place. As an astrologer with the curiosity of the not so straight and narrow path of getting right to the answer, and realizing some answers are not as straight forward as they appear on the surface, I wanted to understand why the question needed to be asked in the first place. In the last few years with the recession hitting the global community, the fears and frustrations have been hard and difficult to shrug off and to be replaced with more positive thoughts. Even those who have not been hit with financial woes are not immune from the anxieties affecting others in our communities. 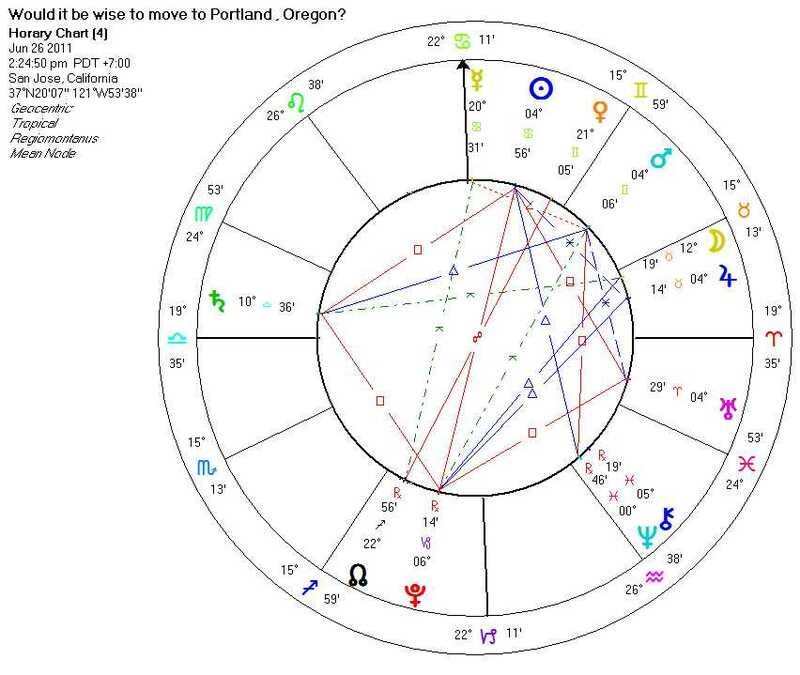 In this atmosphere I asked this question “Would it be wise to move toPortland,Oregon?” The chart was drawn with the ascendant being in Libra, Venus in Gemini is the lord of the first house which represents me and is conjunct the south node and is about to come into a square with Saturn in Libra in the twelfth house, the lord of the fourth house, representing my home and the move. I knew the answer was a little more complex then just a no, but I was not sure for what reasons. This is when I decided to post the question to one of my horary groups, and I was told the answer was negative and that the situation had more to do with me, then the move. I actually was overjoyed as I thought he was right on the spot, and I began to try to decipher how he came to this conclusion to help me better understand why I asked the question. As I looked at Venus coming into the square with Saturn, I saw that I was represented by Venus which was in poor shape and condition in the ninth house of ideas, thoughts and movements. As compared to Saturn who was happy in Libra and had its joy in the twelfth house was in a better situation, even though it was in a malefic house. I began to realize that I was overwhelmed by all the negative thoughts surrounding the financial condition of the state and the city, and their struggles to get out of their situation, and was taking on their anxieties and fears as my own. I asked myself, was I unhappy where I was living, or was it the apartment and not the location a problem? I realized that the global situation represented by Saturn in the twelfth was influencing me in a way by emphasizing the negative and destructive thinking pattern. Coming to terms with my own fears showed me how valuable it was in studying the art of horary in combinations with modern and traditional techniques to begin to understand where we are coming from and to where we are going. This has given me the input and impetus to buckle down and memorize the basics of traditional horary astrology and to combine it with our modern methods to make astrology vital and alive in the twenty first century as it was in ages past.